If you have a garden, you’ve probably already thought about planting asparagus. This article covers tips for growing asparagus at home. While you can grow asparagus from seed, the easiest way is to purchase asparagus crowns. A crown is the root system of a one-year-old asparagus plant that is grown from seed. Each crown can produce 1/2 lb. of spears per year when fully established. Buy one-year-old, disease-free crowns from a reputable crown grower and be sure to select all-male hybrid asparagus varieties such as Jersey Giant, Jersey Prince, and Jersey Knight. These varieties produce spears only on male plants. Female plants produce seeds and yield less spears. 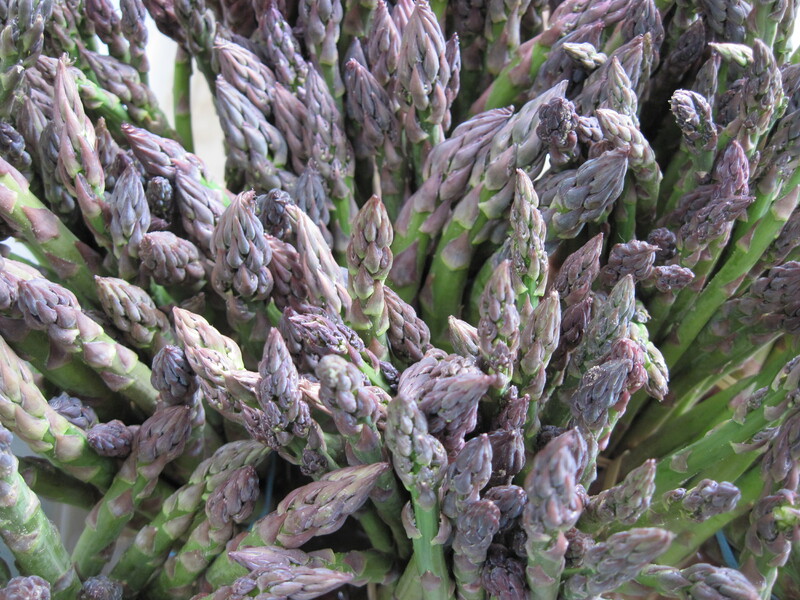 Asparagus crowns/roots can be ordered online or through mail order catalogs for Spring planting. After you purchase your asparagus crowns, your first step should be to identify a spot where you will be planting your asparagus. You’ll need to find an out of the way, full sun spot where you feel comfortable leaving your plants for many years to come. Asparagus is a perenniel which means it will come back year after year. When happy, plants can live 15-20 years. Asparagus will grow in most any soil as long as it has good drainage. Plants prefer a soil pH of 6.5-7.5., and will not do well if the pH is less than 6.0. Have the soil tested to determine phosphorus and potassium needs; or add 20 lbs of a 10-20-10 or similar analysis fertilizer per 1,000 square feet, tilled into the soil before planting. Dig a five to six inch deep trench. Loosen the surrounding soil and remove any weeds. Apply about 1 lb. of 0-46-0 (triple superphosphate) or 2 lbs. of 0-20-0 (superphosphate) fertilizer per 50 feet of row in the bottom of the trench before planting. This will make phosphorus immediately available to the crowns. Place crowns root side down in the trench 18 inches apart. Cover with soil but do not pack the soil down. Restrain from picking any spears the first year. The spears that do come up will eventually fern out and provide food for the plant. Asparagus emerges in the spring. You can pick your asparagus spears after the first year of planting for a about three weeks. After the three week period, let the remaining spears fern out. Each year following, you can increase the harvest time by a couple of weeks. When the harvest is finished, snap all the spears off at ground level. Apply 1/2 lb. of ammonium nitrate fertilizer per 50 feet of row. Another flush of spears will emerge. Let these fern out to provide food for the plant for the following year. When the ferns turn brown, you can cut them back if necessary.